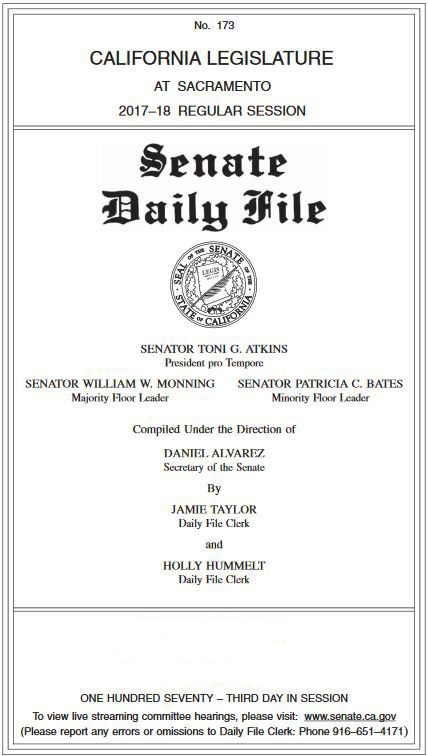 The Senate Daily File - The Senate Daily File is the agenda for all Senate business for each legislative day. Agendas for policy committee meetings along with what measures are eligible for floor actions are listed. Also, included are policy committee memberships, number of measures introduced, deadlines and a session schedule. The Assembly Daily File can be found on the Assembly website. Legislative Calendar and Deadlines - The legislative calendar lists important deadlines, such as the last days to introduce bills, to move bills out of committees, and the last day for the Governor to sign or veto bills, etc. 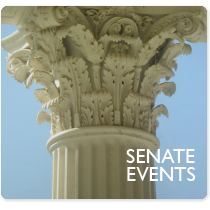 Senate Daily Journal - The Senate Journal is the official record of business for the Senate and is published on a daily basis. The Journal lists bill introductions, parliamentary motions, roll call votes in policy committee and on the Senate Floor. Any official action taken by the body is recorded in the Senate Journal. Senate Histories - The Senate History shows all actions taken on measures from the start of a legislative session. It contains detailed actions taken on Governor's appointments requiring Senate confirmation. Also, the History is a source for several useful charts such as tracking member bill limits, chapters and vetoes. County Representation - A list of the 2019-20 State Senators and the counties they represent. 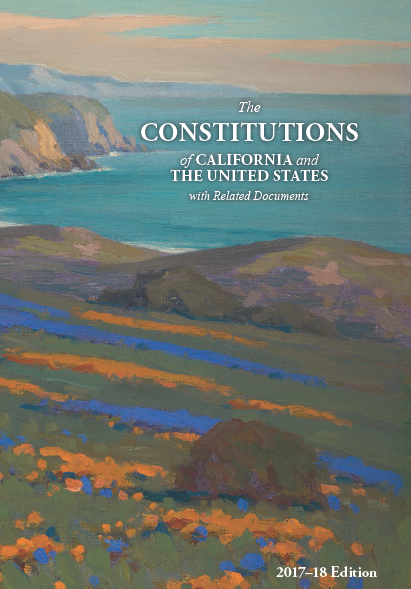 2017-18 California Legislature Handbook -The Legislative Handbook contains the biographies of all current legislators and legislative officers; committee names and membership; the Assembly, Senate, and Joint Rules; and lists of State Officers, accredited press representatives, legislative sessions, and Governors of California. It is published at least once every two-year session pursuant to the Government Code. Senate, Assembly, and Joint Rules - The procedural rules that govern the houses and the lawmaking process. 2017-18: The California Senate Pamphlet - The Senate pamphlet has been prepared in an effort to make the visit to the Capitol and the Senate Chamber more meaningful. 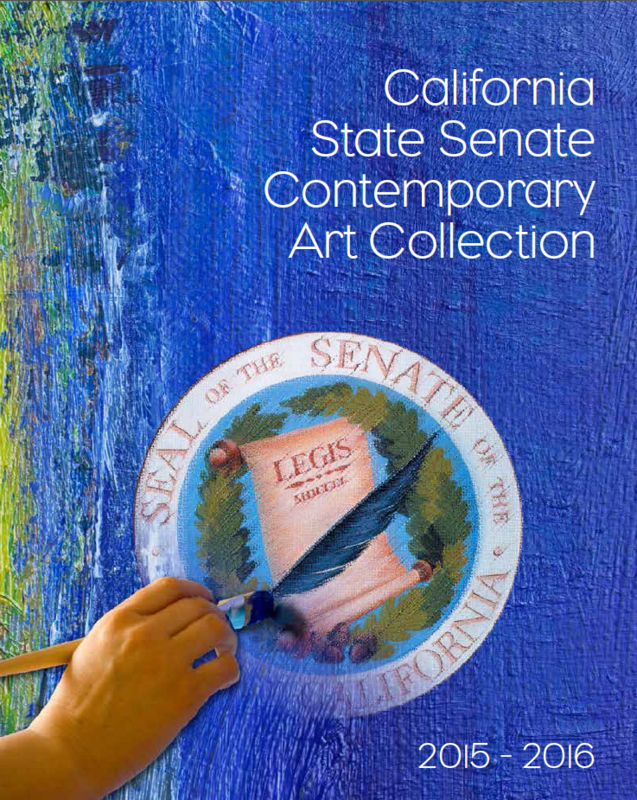 Understanding the legislative process is important to every person in California and the Senate pamphlet offers insight into the workings of the Senate. California The Golden State - “California The Golden State” is an educational glimpse into how California became a state, how the people govern themselves through the constitution and the branches of government, the resources found in the “Golden State”, and our way of life. Additionally, we list the official Emblems of California including the state motto, nickname and animal. The Budget Process: A Citizen's Guide to Participation - When a citizen knows the process, he or she can find important information about state government finance. In the budget there are popular programs and services balanced against demands for tax relief. Demystifying the process for the public at large can help ensure that Californians have access to their own government. Senate Office of Research (SOR) - Established in 1969 by the California Senate Rules Committee, the Senate Office of Research (SOR) is a nonpartisan office charged with serving the research needs of the California State Senate and assisting Senate members and committees with the development of effective public policy. Research findings are often shared through published reports written by SOR staff. ADA Notice - Pursuant to the Americans with Disabilities Act, individuals who, because of a disability, need special assistance to attend or participate in a Senate Committee Hearing or in connection with other Senate Services, may request assistance at the Senate Rules Committee, 1020 N Street, Suite 255 or by calling (916) 651-1505. Requests should be made one week in advance whenever possible.